GarageBand might not be as powerful, but it's certainly in the same ballpark at less than a tenth the price. However, Cubasis now has an ace up its sleeve in the form of well-implemented Audiobus support, making it a great option if you want to create a multi-app iPad studio. Feels like Cubase. Arranging and mixing work very well. Decent effects. Audiobus support. GarageBand aside, it was only a matter of time before one of the major DAW developers became the first to bring a big brand to iPad, and that developer, it turns out, is Steinberg. Cubasis captures the essence and spirit of Cubase in a multitouch MIDI/audio sequencer that, obviously, doesn't come anywhere near the full specification of its Mac/PC parent but does give Cubase users a mobile counterpart with project export to versions 6.5 and 7. 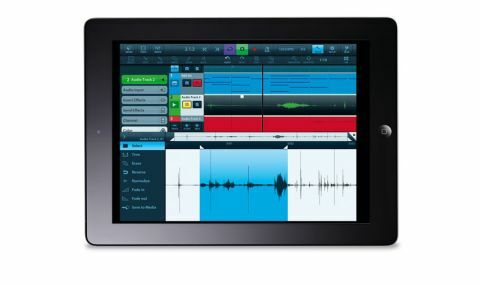 "With audio and MIDI track counts limited only by your iPad's processing power, Cubasis can record via the mic or a Core Audio/Core MIDI interface"
With audio and MIDI track counts limited only by your iPad's processing power, Cubasis can record via the mic or a Core Audio/Core MIDI interface. MIDI parts are edited in a piano roll (draw, move, delete, quantise and transpose notes), while the audio editor has a set of basic processes (there's no timestretch or pitchshift). Around 70 HALion Sonic sampled instruments are included, but while they're of decent quality, stylistically they're nothing to get too excited about, comprising plenty of guitars, keyboards, drums and orchestral instruments, but precious little in the way of interesting electronic sounds. 'Generic' is definitely the word, and with attack and release being the only editable parameters on offer, there's really no getting away from it. The same goes for the 300 MIDI and audio loops, which could cheerfully serve as placeholders but little else. Ten effects are onboard (three inserts per channel and three fixed aux buses sending to two delays and a reverb), and these are pretty effective, despite their minimal controls. It's in the arrange page and mixer that Cubasis really shines, with multitouch making navigating, editing and mixing supremely smooth and easy. As usable and impressively 'Cubase-like' as it all is, though, the price is a little hard to swallow, especially for non-Cubase users. UPDATE: As of version 1.1 Cubasis offers support for Audiobus, which enables you to use similarly-compatible instrument and effect apps in your projects. It's a doddle to use, so you can now record parts using the likes of Korg's synths and Moog's Animoog (among others). This increases its appeal considerably. Cubasis is now capable of serving as the hub of a very powerful iOS studio, which goes some way to justifying its relatively high price tag.